Winter is thawing, we’re coming out of hibernation and it’s a great time to get the inside and outside of your house sparkling clean! It’s also time to declutter and tidy up your home – whether you’ve let Christmas ornaments pile up in the garage or are getting reminders to clean your kitchen from a stinky fridge. 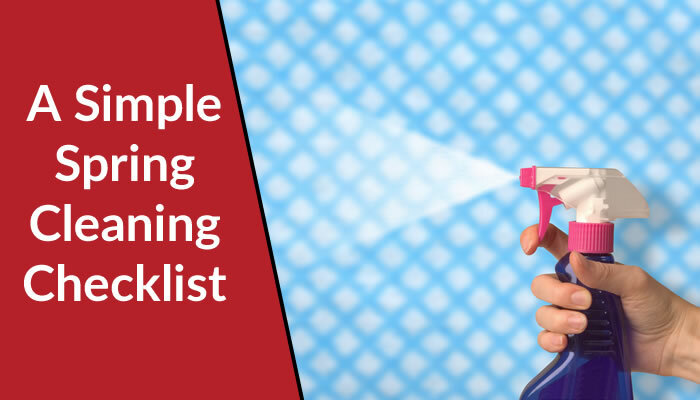 The first part of this spring cleaning checklist focuses on all rooms, and then we move on to specific rooms. So put on some comfy clothes, turn up the music and get started. Pick up some microfiber cloths. If you don’t have some already, you are missing out on this fantastic cleaning tool. Dust and clean ceiling fans (don’t forget the bathroom fan), vents and light fixtures. Test batteries in all smoke detectors and carbon monoxide detectors. Clean windowsills and window tracts. Clean carpets and rugs. You might want to hire a contractor to do this. Empty out your refrigerator and toss expired food and condiments. Wash the fridge and freezer and defrost the freezer. If you want to really deep clean your kitchen, pull the fridge out and clean behind it. Empty out your cabinets and wash the shelves and doors. Add shelf liners to pretty them up. Clean your oven and stovetop. Remove furniture seat cushions and vacuum crevices. You might find a long lost treasure!! Unplug all electronics and dust them. Dust and wash entertainment centres. Clean artwork and framed photos gently with a damp cloth. Don’t spray cleaner directly onto artwork or photos. Empty cabinets, cupboards and drawers and wash them. Organize their contents. Wash your shower curtain (throw in a towel, the fibers of the towel act as an abrasive on the vinyl). 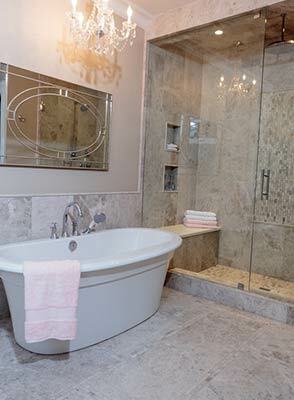 Find a local company that specializes in installing frameless glass shower doors and bathtub enclosures. Since there are no grooves or corners where dirt and mould can accumulate, they’re much easier to clean and maintain. Go through your toiletries and remove empties and ones you don’t use. Remember to put the old containers in the recycle bin. Empty the dresser and nightstand drawers and wash them. Organize what’s inside. Go through your closet and donate items you don’t wear. Wipe the outside of the washer with an all-purpose cleaner. Use a cloth and cleaner to scrub the inside. Wash the outside of the dryer with an all-purpose cleaner. Vacuum out the lint trap and vent. Get in the habit of cleaning out the lint trap after each dryer load. If you don’t do this simple task lint builds up reducing air flow and drying lint can cause humidity levels to rise around vents causing mildew and mold to develop in walls and insulation. But most important lint is combustible. Its build-up can cause a fire. Replace old hampers and laundry baskets. Clean out the gutters. If you don’t want to get up on a ladder and dig out leaves, hire a company that specializes in gutter cleaning. Take off window screens and wash with a mild soap and water solution. Wash the windows with a cleaning solution. Pressure wash the siding of your home to remove dirt. Hire a pressure washing company if you don’t want to take this on yourself. Organize everything and donate what you don’t need. Or consider holding a garage sale. Sweep the floor and pressure wash it or hose it out. Wash garage windows and doors. Pressure wash or scrub your deck and outdoor furniture. Dust and wash light fixtures. Get rid of dead plants and wash plant pots. I hope you find this spring cleaning checklist useful while you tidy up your home. It’s so inspiring to start a new season with a freshly scrubbed house. It can also be the perfect time to upgrade your space with new paint, bedding, drapery, upholstery and artwork. A Stroke of Genius can turn your vision into a beautiful reality. Contact us for a colour consultation, to discuss kitchen or bathroom renovations, to talk décor and more.